kegemaran moment of 3x12- The Coming of Arthur? pilihan peminat: "Where is your sister? Where is Guinevere?" With Merlin something I personally came to realize is that good and evil in this tunjuk is far from black and white. Many seem to agree that the good guys truly are the good guys and the bad guys are the bad guys. I have a different take; I feel like the villains really aren't that bad, they just want some security...some safety...the ability to be themselves. And some of the good guys (yes my finger is pointed at anda Uther) aren't really all that good. Merlin I think has this different sort of handsomeness. He's not your classic blonde haired, tough, physically fit guy. He's kind on the scawny side but I think he's cute enough to make the bahagian, atas 5. He has a really nice face and I Cinta his hair. And his eyes I adore his eyes. They are such a brilliant blue. Merlin is proof that a person doesn't have to meet the typical standards to be good looking. So I’ve been Membaca a lot of meta lately, and some of the responses I’ve seen have got my hackles up. Read at your peril. This is a ficlet I wrote about eighteen months lalu after season 3 finished airing. I just thought I'd share it here. Enjoy! 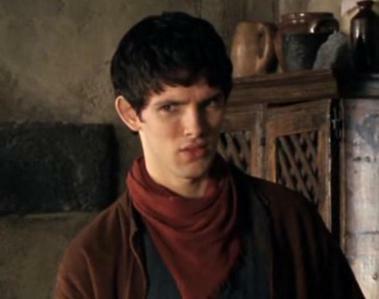 a video telah ditambah: Merlin and Arthur - Gwen says your cooking? So, what did anda think of that ending?